The first Dr B R Ambedkar Football Tournament organized by All Sikkim Scheduled Caste Welfare Association (ASSCWA), in collaboration with Social Welfare department, got off to a colourful start at the Paljor Stadium in Gangtok on Tuesday. The football tournament was declared open by State Human Resource Development Minister R B Subba. Subba in his inaugural speech congratulated the organizing committee for hosting such a major event at Gangtok. He also urged the students and teachers to promote sports, especially football. Committee chairman S Baraily informed that the birth anniversary of Dr B R Ambedkar is celebrated every year in Gangtok and this time they chose sports as their subject with the aim of connecting the youth through sports. The tournament will be an annual event, disclosed the organizers adding that in the inaugural edition, the knockout encounters will be held till April 9 and the final will be played on April 14. The final will be graced by Chief Minister Pawan Chamling as the chief guest and will also have Komal Thatal and other national footballers as special guests, informed the organizers. The tournament in its inaugural edition is witnessing a participation of 14 teams from Sikkim and neighbouring areas. The winners will walk away with a cash prize of Rs one lakh and the runner up will be awarded Rs 70,000. 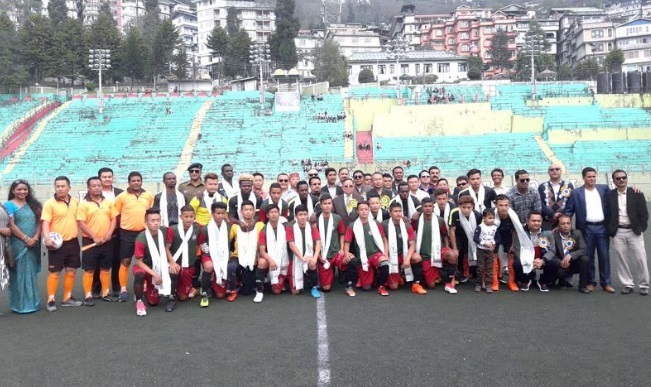 The inaugural function was also attended by local area MLA Pintso Chopel Bhutia, Additional Director General of Police (ADGP) Akshay Sachdewa, Gangtok Municipal Corporation (GMC) chairman Ashish Rai, students from various schools and football enthusiasts.